Since the current Steering Committee’s term expires on 31 July 2019, elections for the new Steering Committee will be held this spring. Members will hold Steering Committee elections from 3 to 19 May 2019. In cooperation with the University of Stuttgart and the Textile Partnership the ‘Integrated Best Available Wastewater Management Symposium’ will take place at Tongji University in Shanghai, China, on 26 March 2019. The event will be held in English and Mandarin. More information can be found here. Please also note 11 April 2019 when our first working meeting of this year will take place in Cologne. At this meeting, participants can share their experiences and receive input on different topics at various workshops. You can find more detailed information and the invitation on the Members’ area. The OECD is currently conducting the so-called Alignment Assessments in order to implement the OECD Due Diligence Guidance for Responsible Supply Chains in the Garment and Footwear Sector. By doing so the OECD is reviewing the extent to which approaches used by existing sector initiatives to promote sustainability in the textile sector apply the due diligence guidance recommendations. The overarching goal is to help to bring about a common understanding of due diligence within the sector and to facilitate mutual recognition of existing initiatives. These efforts should help as many companies as possible in the sector to fulfil their due diligence obligations along the supply chain. The results and recommendations of the OECD Alignment Assessment will influence the further development of the Review Process. They will also represent an important foundation for further harmonisation with other European and international initiatives. The Dutch Agreement on Sustainable Garments and Textile (AGT) and the Sustainable Apparel Coalition (SAC, Higg Brand and Retail Module) are currently taking centre stage. They are also undergoing or have recently completed the OECD Alignment Assessment. After completing the document analysis, the OECD started conducting telephone interviews with selected Partnership members from all stakeholder groups at the end of February. The OECD will present the results of its Alignment Assessment at the next Steering Committee meeting on 8 May. You can address any questions regarding this topic to Andreas Edele. The Partnership Initiative on Living Wages has started! The first companies have announced their participation in the country module for Cambodia. A number of others are already involved in the basic module on purchasing practices and have already set themselves a goal for wages for this year. All companies that source goods from Cambodia are invited to participate in the module. By participating, they are strengthening the negotiating position of our partner ACT. Moreover, they are making a fundamental contribution towards a structural increase in wages in the Cambodian textile industry through a collective bargaining agreement. This has been a central goal of our Partnership from the outset. Workshops on living wages will be held at the working meeting in Cologne on 11 April. Among others the online tool for analysing and improving purchasing practices will be presented on this occasion. The Partnership Secretariat is looking forward to a broad participation. More information about the Partnership Initiative’s next steps will be shared via the members’ area in April at the latest. What will happen to the Review Process from 2020 on? The expert group review process, which has been strengthened by additional experts, is addressing this question. By September, proposals should be drafted showing how the Review Process might look like in the future based on the OECD Alignment Assessment and the lessons learned from ongoing processes. The further harmonisation and/or recognition of other initiatives, procedural simplifications and exemptions, or/and the consideration of other areas in textile supply chains may play a role in this process. The goal is to enhance the public credibility of the Partnership and its individual members, and to provide members with more targeted support in fulfilling their OECD recommended due diligence obligations. At the same time a good balance between the necessary obligation to provide evidence and the workload related to these obligations shall be reached. The Partnership Secretariat will keep all members updated about the future process. Final recommendations will be presented to the Steering Committee in September, allowing for implementation by the start of reporting in January 2020. Please contact Anneke Bremer if you are interested in taking part in ongoing discussions. We welcome the ‘Bundesverband E-Commerce und Versandhandel Deutschland bevh e.V.’ as a new member. The E-Commerce Association, which is compromising 500 companies, has previously been a member until 2018. TexPerT is available until 31 March for you to enter your data. Until this date, all members have to update their baseline and submit their Progress Report and new Roadmap. You can find the latest information about adjustments to the Review Process and the goals from 2020 onwards here. The Steering Committee has approved the project plan for implementing the Partnership Initiative (PI) on Living Wages. Until 31 March 2019 businesses may declare their interest in participating in the PI ─ some commitments have already been made. More information can be found here. Please contact Kristin Huber directly if you have any questions about participating in the Partnership Initiative. The Steering Committee has approved the extension of the Impact Assessment project. The implementation of the impact assessment for living wages is to be launched in 2019 with the first baseline survey. Furthermore, the concept shall be expanded to include chemicals and environmental management, and will then be implemented. The goal for the Partnership and its members is to learn lessons from the results and to process these for the Partnership’s advancement and for the general public. Plans for a potential Partnership Initiative on grievance mechanisms are moving forward into the next round with a basic framework of three modules. The concept for this initiative has already been presented to the Partnership Initiative Committee. Here you can find more information. The Steering Committee has approved a project plan for the PI on Chemicals and Environmental Management that has been adapted to the new structures. This plan still contains three dovetailed modules to reduce the use of harmful chemicals in textile production. Additional implementation steps and milestones for the Partnership Initiative have been defined. Please contact Rahel Lemke if you have any questions concerning this PI. In 2018 many milestones have been passed in the process of broadening the Textile Partnership’s international reach. The strategic alliances are planned to be continuously fleshed out during this year. This will be enabled by the ongoing and planned Partnership Initiatives and the harmonisation of approaches, which is also based on the assessment of the Partnership by the OECD. The Steering Committee took a number of important decisions at its first meeting of the year: Among others they included approval of the project plan for the Partnership Initiative on Living Wages with two modules to date. The members that are already involved, our strategic partners and the Partnership Secretariat are ready for implementation. Please get in touch with us if you have any questions about participating. The resolution on overhauling the Review Process and Partnership procedures is also an important step for the Partnership’s future development and positioning. The OECD Alignment Assessment, which is to be carried out by September 2019, provides the basis for this overhaul. Progress has also been made in the areas of grievance mechanisms and impact assessment, and within the two Partnership Initiatives that are already running successfully. This year, we want to take the Partnership to the next level, continuing to develop it into a platform for information, learning and dialogue on all issues related to due diligence and sustainable, forward-looking business models. Besides expanding cooperative projects and our range of informational services, we are organising two working meetings to this end in 2019: the first one in April (Cologne) and the second one in September (Hamburg). These working meetings serve to exchange expertise, provide information about the status of topics being worked on in Partnership and, of course, foster networking. We are looking forward to seeing many of you at these events. This year also brings the next Steering Committee elections. You can find information about the process and deadlines in this newsletter and on the Partnership website. As you can see, our Partnership has kicked off an exciting and eventful year. With the three pillars of the Partnership’s work, our extensive cooperation network, the growing confidence in our collaboration, and smoothly running processes, we have set the course for meeting our goals and advancing our initiative. We are looking forward to continuing this excellent and close cooperation and to seeing you again at the working meeting on 11 April in Cologne, if not sooner. The Steering Committee held its 22nd meeting in Berlin on 30 November. At this event, the Steering Committee set out key items for the year ahead and discussed issues feeding into longer-term planning. The Review Process will be further simplified and improved for the 2019 reporting period. The Committee also approved the Partnership Initiative on Living Wages. TexPerT will be opened for the 2019 Review Process on 8 January. All members have to enter their data by 31 March, which will then be verified by an independent third party. The Partnership will then publish its members’ Roadmaps and Progress Reports in the summer. As before, the Partnership Secretariat will provide you with intensive support during reporting for the Review Process. Starting in January, you can find comprehensive information about this in the Members’ area. You can also send your questions to review@textilbuendnis.com at any time. The requirements for both mandatory and recommended targets have been tightened up based on the experience gained in 2018. Definitions, information about admissible evidence and links to appropriate support services for each target will be available in standardised factsheets. The comparison of standards has also been expanded such that some targets no longer need to be set if you already meet the requirement by means of a membership or a certificate. The requirement to declare support for zero tolerance of corruption is another mandatory target that has been added for 2019. The existing target for wastewater has been tightened to enable the Partnership to agree that the ZDHC wastewater standard will be the minimum standard for wastewater discharge in the textile industry. Alongside these substantive improvements, the Steering Committee agreed that even more support and advice would be provided by the Partnership Secretariat and the verifiers during the Review Process in 2019. The publicly accessible reports should be more clearly structured and comprehensible in the coming reporting year – based on feedback from the members. For example, it should be easier to recognise targets that have been achieved, and the structure should provide stronger links to due diligence requirements. The data that have to be published will remain unchanged. 2019 will see the start of the Partnership Initiative on Living Wages. The initiative is designed to offer all members the chance to become involved, irrespective of their size or procurement markets. At its meeting, the Steering Committee once again emphasised the relevance of Partnership Initiatives for our common goals, along with the expectation that as many members as possible would participate in the Partnership Initiative. Detailed information about the Partnership Initiative is available here. The Steering Committee has given the green light to continuing work on effective grievance mechanisms. This will include offers of support and planning a Partnership Initiative in 2019. Here, too, members are invited to participate. The Steering Committee wishes to continue making genuine progress with the achievement of results by individual members and by the Partnership as a whole. It therefore approved a preliminary results concept for the topic of living wages with the aim of expanding it to embrace chemicals and environmental management. Data collection is expected to begin next year. Baseline data from TexPerT will be used in order to keep the workload for the members to the minimum. To this end, existing questions on living wages have been tightened up in some places. We welcome Trigema Inh. W. Grupp e. K. as a new member. The company produces sportswear and leisure wear textiles, and was previously a member up to 2017. Varvaressos S.A. European Spinning Mills is a Greek firm that produces various yarns which it distributes in 20 countries. We welcome the company as a new Partnership member. Another new arrival to the Partnership is the Association of German Fashion and Textile Designers (VDMD) – a network of about 600 employed and self-employed fashion interior and textile designers. We welcome the VDMD as part of the Business stakeholder group. Another step towards internationalisation has been taken by Alsico NV. The company, which is an associated member of the Partnership for Sustainable Textiles via the Dutch Agreement on Sustainable Garment and Textiles (AGT), has published its Action Plan on the Partnership’s website. The firm fulfils its reporting obligation as a member of the AGT. This means that Alsico also meets the requirements for associated membership and has unrestricted access to all the Partnership’s services and information. Achieving more together – the Partnership Initiative on Living Wages is launched! The Steering Committee approved the launch of the Partnership Initiative on Living Wages at its meeting on 30 November. It is intended to help companies continually increase industry wages by improving their internal purchasing practices and by strengthening freedom of association and collective agreements in production countries. The Partnership Initiative will have a modular structure. In a basic module, companies participating in the Partnership Initiative commit themselves to analyse their purchasing practices using the Purchasing Practices Self-Assessment Tool developed by Action Collaboration Transformation (ACT), and to improve them on this basis. In additional modules, companies will also demand that living wages are paid in production countries. Cambodia is currently expected to be the first pilot country. In Cambodia the Partnership Initiative is planning to promote implementation of the collective agreement supported by the ACT in the industry by involving more companies in the Partnership. On 17 January, the expert group will hold a webinar providing information about the Initiative. You can participate in the webinar via a link in the Members’ area. Companies wishing to join the Initiative should contact the Secretariat. Under the slogan ‘Learning from one another, jointly achieving targets’, the Partnership presents ten selected projects here (in German), in which Partnership members are working to improve social, environmental and economic conditions along the entire textile supply chain. While ALDI SÜD and ALDI Nord are working on early learning and Brands Fashion concentrates on living wages, C&A has developed the world’s first completely circular jeans. Learn how transparency can be created for sustainable cotton and how consumers can find out about the origin and production of their textiles thanks to a transparency code at Dibella and GREIFF. Lebenskleidung focuses on the importance of a regional wool value chain, while ZDHC provides information about substituting harmful chemicals in the production of synthetic leather. Terre des hommes is campaigning for an end to child labour and forced labour in the textile industry in southern India. VAUDE is also working with its level-2 suppliers to improve environmental and social standards, and KiK is enhancing building safety in Pakistan by adopting the Bangladesh Accord Standards.The projects have differing themes but they all aim to make products and processes more sustainable. They all share their experience with implementation, offer basic information for initiating similar projects, and generate impetus for cooperation. 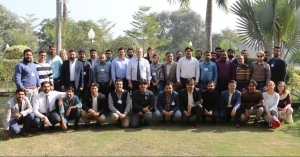 The Partnership Initiative’s first basic training session has taken place in Lahore, Pakistan. At the event, local textile producers who use wet processing gained an overview of practical approaches to embracing more sustainable environmental and chemicals management. The training session on 1 December was a good place for swapping ideas following the Environmental Forum in Lahore on 28 and 29 November. Partnership members had invited their suppliers and got a huge response. More than 80 people applied to take part, but there were only 40 places available. Participants included suppliers of Aldi, Brands Fashion, Primark, Rewe, s.Oliver, Takko and Tchibo. They also expressed very strong interest in further training sessions in Pakistan. Guidelines entitled Developing and implementing your own policy – Responsible procurement of new wool are now available as a new support service in the area of fibres. This document describes various aspects that members should take into consideration when drawing up a policy and give suggestions for content. You can access the guidelines either from the Members’ area under Tools and Support, or by clicking here. The Partnership members Tchibo and Adidas, along with other companies from the region, NGOs, the ILO and trade unions, attended a conference in Phnom Penh, Cambodia. Its main topic was the relevance of social dialogue in the textile industry. All those present agreed that dialogue between management and workers is a key mechanism for improving social standards and production conditions. Textile entrepreneurs from Pakistan described how production conditions in their plants have been improved using this approach. The key message was that everyone benefits from optimising work processes and improving the design of workplaces. A Cambodian trade union representative stressed that their work focuses on creating a culture of trust and cooperation between the management and the workforce, and on setting up joint health and safety committees (organisation) in factories. The event was organised by the GIZ regional programme Social and Labour Standards in the Textile and Garment Sector in Asia, which supports approaches by the private sector and state players in the textile and clothing industry in South-East Asia. This helps to improve the social and labour standards in the sector.